Malignant diseases of the lymphatic system are further classified as Hodg-kin and non-Hodgkin lymphomas (NHL). 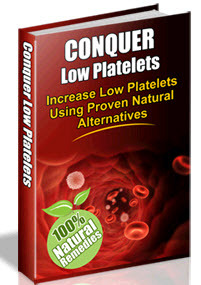 NHL will be discussed here because most NHLs can be diagnosed on the blood analysis. 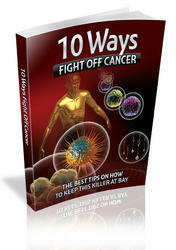 > Non-Hodgkin lymphomas arise mostly from small or blastic B-cells. > Small-cell NHL cells are usually leukemic and relatively indolent, of the type of chronic lymphocytic leukemia and its variants. > Blastic NHL (precursor lymphoma) is not usually leukemic. An exception is the lymphoblastic lymphoma, which takes its course as an acute lymphocytic leukemia. > Plasmacytoma is an osteotropic B-cell lymphoma that releases not its cells but their products (immunoglobulins) into the bloodstream. > Malignant lymphogranulomatosis (Hodgkin disease) cannot be diagnosed on the basis of blood analysis. It is therefore discussed under lymph node cytology (p. 176). The modern pathological classification of lymphomas is based on morphology and cell immunology. The updated classification system according to Lennert (Kiel) has been adopted in Germany and was recently modified to reflect the WHO classification. The definitions of stages I-IV in NHL agree with the Ann Arbor classification for Hodgkin's disease. * Cited markers are positive, absent markers are indicated with a minus sign. Non-Hodgkin lymphoma cells derive monoclonally from specific stages in the B- or T-cell differentiation, and their surface markers reflect this. The surface markers are identified in immunocytological tests (Table 7) carried out on heparinized blood or bone marrow spicules. The blastic lymphomas will not be discussed further in the context of diagnostics based on blood cell morphology. 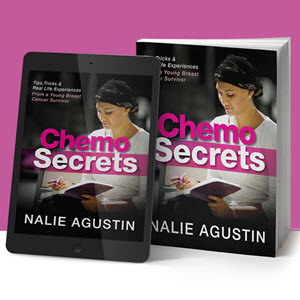 The findings in the primarily leukemic forms of the disease, such as lymphoblastic lymphoma, resemble those for ALL (p. 104). Other blastic lymphomas can usually only be diagnosed on the basis of lymph node tissue (Fig. 65). Of course, despite all the progress in the analysis of blood cell differentiation, often analysis of histological slides in conjunction with the blood analysis is required for a confident diagnosis. A chronic lymphadenoma, or chronic lymphocytic leukemia, can sometimes be clinically diagnosed with some certainty. An example is the case of a patient (usually older) with clearly enlarged lymph nodes and significant lymphocytosis (in 60% of the cases this is greater than 20 000/^l and in 20% of the cases it is greater than 100 000/^l) in the absence of symptoms that point to a reactive disorder. The lymphoma cells are relatively small, and the nuclear chromatin is coarse and dense. The narrow layer of slightly basophilic cytoplasm does not contain granules. Shadows around the nucleus are an artifact produced by chromatin fragmentation during preparation (Gumprecht's nuclear shadow). In order to confirm the diagnosis, the B-cell markers on circulating lymphocytes should be characterized to show that the cells are indeed monoclonal. The transformed lymphocytes are dispersed at varying cell densities throughout the bone marrow and the lymph nodes. A slowly progressing hypogammaglobu-linemia is another important indicator of a B-cell maturation disorder. Transition to a diffuse large-cell B-lymphoma (Richter syndrome) is rare: B-prolymphocytic leukemia (B-PLL) displays unique symptoms. At least 55% of the lymphocytes in circulating blood have large central vacuoles. When 15-55% of the cells are prolymphocytes, the diagnosis of atypical CLL, or transitional CLL/PLL is confirmed. In some CLL-like diseases, the layer of cytoplasm is slightly wider. B-CLL was defined as lym-phoplasmacytoid immunocytoma in the Kiel classification. According to the WHO classification, it is a B-CLL variation (compare this with lympho-plasmacytic leukemia, p. 78). CLL of the T-lymphocytes is rare. The cells show nuclei with either invaginations or well-defined nucleoli (T-prolym-phocytic leukemia). The leukemic phase of cutaneous T-cell lymphoma (CTCL) is known as Sezary syndrome. The cell elements in this syndrome and T-PLL are similar. Fig. 23 CLL. 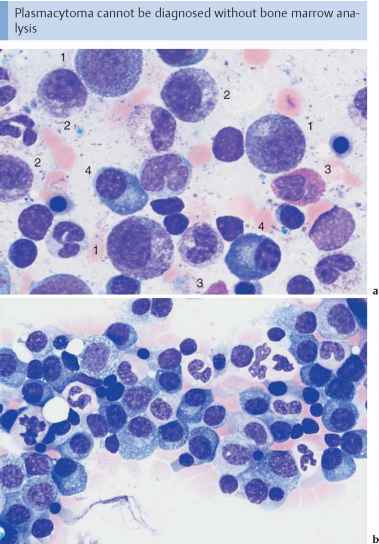 a Extensive proliferation of lymphocytes with densely structured ► nuclei and little variation in CLL. Nuclear shadows are frequently seen, a sign of the fragility of the cells (magnification X400). b Lymphocytes in CLL with typical coarse chromatin structure and small cytoplasmic layer (enlargement of a section from 23 a, magnification X1000); only discreet nucleoli may occur. c Slightly eccentric enlargement of the cytoplasm in the lymphoplasmacytoid variant of CLL. Fig. 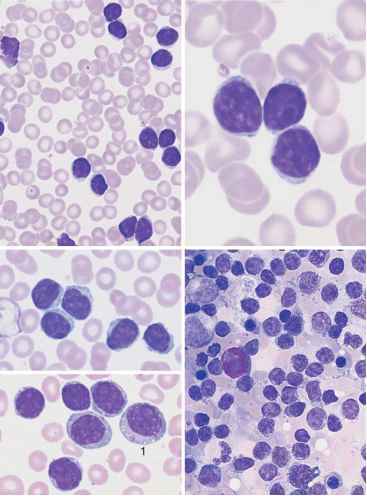 23 d Proliferation of atypical large lymphocytes (1) with irregularly structured nucleus, well-defined nucleolus, and wide cytoplasm (atypical CLL or transitional form CLL/PLL). e Bone marrow cytology in CLL: There is always strong proliferation of the typical small lymphocytes, which are usually spread out diffusely. Fig. 24 Lymphoma of the B-cell andT-cell lineages. 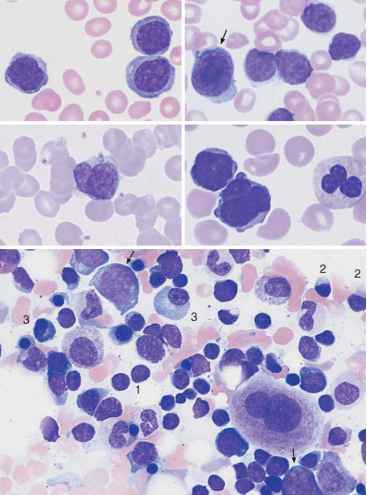 a Prevalence of large lymphocytes with clearly defined nucleoli and wide cytoplasm: prolymphocytic leukemia of the B-cell series (B-PLL). bThe presence of large blastic cells (arrow) in CLL suggest a rare transformation (Richter syndrome). c The rare Sézary syndrome (T-cell lymphoma of the skin) is characterized by irregular, indented lymphocytes. d Prolymphocytic leukemia of the T-cell series (T-PLL) with indented nuclei and nucleoli (rare). 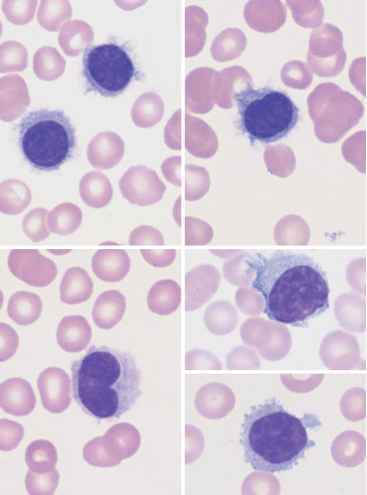 e Bone marrow in lymphoplasmacyticimmunocytoma: focal or diffuse lymphocyte infiltration (e.g., 1), plasmacytoid lymphocytes (e.g., 2) and plasma cells (e.g., 3). Red cell precursors predominate (e.g., basophilic erythroblasts, arrow). The pathological staging for CLL is always Ann Arbor stage IV because the bone marrow is affected. In the classifications of disease activity by Rai and Binet (analogous to that for leukemic immunocytoma), the transition between stages is smooth (Tables 8 and 9). The CBC shows lymphocytes with relatively wide layers of cytoplasm. The bone marrow contains a mixture of lymphocytes, plasmacytic lymphocytes, and plasma cells. In up to 30% of cases paraprotein is secreted, predominantly monoclonal IgM. This constitutes the classic Waldenstrom syndrome (Waldenstrom macroglobulinemia). The differential diagnosis may call for exclusion of the rare plasma cell leukemia (see p. 82) and of lymphoplasmacytoid immunocytoma, which is closely related to CLL (see p. 74). > Lymphoplasmacytoid immunocytoma: This is a special form of B-CLL in which usually only a few precursors migrate into the bloodstream (a lesser degree of malignancy). A diagnosis may only be possible on the basis of bone marrow or lymph node analysis. > Lymphoplasmacytic lymphoma: Few precursors migrate into the bloodstream (i.e., bone marrow or lymph node analysis is sometimes necessary). There is often secretion of IgM paraprotein, which can lead to hyperviscosity. Further diagnostics: Marker analyses in circulating cells, lymph node cytology, bone marrow cytology and histology, and immunoelectrophoresis. Plasmacytoma cells migrate into the circulating blood in appreciable numbers in only 1-2 % of all cases of plasma cell leukemia. Therefore, paraproteins must be analyzed in bone marrow aspirates (p. 82). In all cases of non-Hodgkin lymphoma, the transformed cells may migrate into the blood stream. This is usually observed in mantle cell lymphoma: The cells are typically of medium size. On close examination, their nuclei show loosely structured chromatin and they are lobed with small indentations (cleaved cells). Either initially, or, more commonly, during the course of the disease, a portion of cells becomes larger with relatively enlarged nuclei (diameter 8-12 ^m). These larger cells are variably "blastoid." Lymphoid cells also migrate into the blood in stage IV follicular lymphoma. Fig. 25 Mantle cell lymphoma. a Fine, dense chromatin and small indentations of the nuclei suggest migration of leukemic mantle cell lymphoma cells into the blood stream. b Denser chromatin and sharp indentations suggest migration of follicular lymphoma cells into the blood stream. c Diffuse infiltration of the bone marrow with polygonal, in some cases indented lymphatic cells in mantle cell lymphoma. Bone marrow involvement in follicular lymphoma can often only be demonstrated by histological and cytogenetic studies. "Monocytoid" cells with a wide layer of only faintly staining cytoplasm occur in blood in marginal zone lymphadenoma (differential diagnosis: lymphoplasmacytic immunocytoma). Hairy cell leukemia (HCL). In cases of slowly progressive general malaise with isolated splenomegaly and pancytopenia revealed by CBC (leukocy-topenia, anemia, and thrombocytopenia), the predominating mononuclear cells deserve particular attention. The nucleus is oval, often kidney bean-shaped, and shows a delicate, elaborate chromatin structure. The cytoplasm is basophilic and stains slightly gray. Long, very thin cytoplasmic processes give the cells the hairy appearance that gave rise to the term "hairy cell leukemia" used in the international literature. The disease affects the spleen, liver, and bone marrow. Severe lymphoma is usually absent. Aside from the typical hairy cells with their long, thin processes, there are also cells with a smooth plasma membrane, similar to cells in im-munocytoma. A variant shows well-defined nucleoli (HCL-V, hairy cell leukemia variant). A bone marrow aspirate often does not yield material for an analysis ("punctio sicca" or "empty tap") because the marrow is very fibrous. Apart from the bone marrow histology, advanced cell diagnostics are therefore very important, in particular in the determination of blood cell surface markers (immunophenotyping). This analysis reveals CD 103 and 11 c as specific markers and has largely replaced the test for tartrate-resistant acid phosphatase. Splenic lymphoma with villous lymphocytes (SLVL). This lymphatic system disease mostly affects the spleen. There is little involvement of the bone marrow and no involvement of the lymph nodes. The blood contains lymphatic cells, which resemble hairy cells. However, the "hairs," i.e., cyto-plasmic processes, are thicker and mostly restricted to one area at the cell pole, and the CD 103 marker is absent. H Splenomegaly may develop in all non-Hodgkin lymphomas. In hairy cell leukemia, the rare splenic lymphadenoma with villous lymphocytes (SLVL) and marginal zone lymphadenoma may be seen. These mostly affect the spleen. Fig. 26 Hairy cell leukemia and splenic lymphoma. 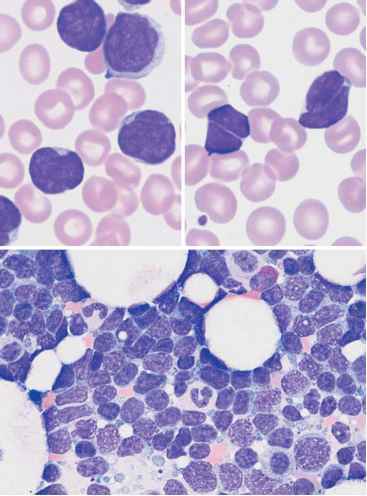 a and b Ovaloid nuclei and finely "fraying" cytoplasm are characteristics of cells in hairy cell leukemia (HCL). c Occasionally, the hairy cell processes appear merely fuzzy. d and e When the cytoplasmic processes look thicker and much less like hair, diagnosis of the rare splenic lymphoma with villous lymphocytes (SLVL) must be considered. Here, too, the next diagnostic step is analysis of cell surface markers. Plasmacytoma is the result of malignant transformation of the most mature B-lymphocytes (Fig. 1, p. 2). For this reason the diagnostics of this disease will be discussed here, even though migration of its specific cells into the blood stream (plasma cell leukemia) is extremely rare (1-2%). Immunoelectrophoresis of serum and urine is performed when elec-trophoresis shows very discrete gammaglobulin, or globulin, fractions, or when hypogammaglobulinemia is found (in light-chain plasmacytoma). A wide range of possibilities arises for the differential diagnosis of monoclonal transformed cells (Table 10). The presence of more than 10% of plasma cells, or atypical plasma cells in the bone marrow, is an important diagnostic factor in the diagnosis of plasmacytoma. For more criteria, see p. 84. * The current WHO classification suggests "multiple myeloma" (MM) for generalized plasmacytoma and "plasmacytoma" only for the rare solitary or nonosseous form of plasmacytoma. Fig. 27 Reactive plasmacytosis and plasmacytoma. 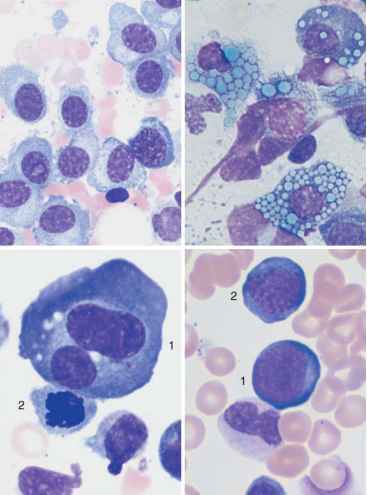 a Bone marrow cytology with clear reactive features in the granulocyte series: strong granulation of promyelocytes (1) and myelocytes (2), eosinophilia (3), and plasma cell proliferation (4): reactive plasmacytosis (magnification X630). b Extensive (about 50%) infiltration of the bone marrow of mostly well-differentiated plasma cells: multiple myeloma (magnification X 400). It is not easy to visually distinguish malignant cells from normal plasma cells. Like lymphocytes, normal plasma cells have a densely structured nucleus. Plasma cell nuclei with radial chromatin organization, known as "wheel-spoke nuclei," are mostly seen during histological analysis. The following attributes suggest a malignant character of plasma cells: the cells are unusually large (Fig. 28c), they contain crystalline inclusions or protein inclusions ("Russell bodies") (Fig. 28b), or they have more than one nucleus (Fig. 28c). In the differential diagnosis, they must be distinguished from hemato-poietic precursor cells (Fig. 28d), osteoblasts (Fig. 20c), and blasts in acute leukemias (see Fig.31, p. 97). Bone marrow involvement may be focal or in rare cases even solitary. Aside from cytological tests, bone marrow histology assays are therefore indicated. Sometimes, the biopsy must be obtained from a clearly identified osteolytic region. Although plasmacytomas progress slowly, staging criteria are available (staging according to Salmon and Durie) (Table 11). Therapy may be put on hold in stage I. Smoldering indolent myeloma can be left for a considerable time without the introduction of therapy stress. However, chemotherapy is indicated once the myeloma has exceeded the stage 1 criteria. * Monoclonal in each case. Fig. 28 Atypical cells in multiple myeloma. a Extensive infiltration of the bone marrow by loosely structured, slightly dedifferentiated plasma cells with wide cytoplasm in multiple myeloma. b In multiple myeloma, vacuolated cytoplasmic protein precipitates (Russell bodies) may be seen in plasma cells but are without diagnostic significance. c Binuclear plasma cells are frequently observed in multiple myeloma (1). Mitotic red cell precursor (2). d Differential diagnosis: red cell precursor cells can sometimes look like plasma cells. Proerythroblast (1) and basophilic erythroblast (2). What are gumprecht shadows or bodies? Can monotonous proliferation of lymphocytes be benign?